Even as a magisterial inquiry is on in the Jodhan custodial death case, the aggrieved family of the deceased youth today demanded monetary compensation or a job for the youth’s wife while stressing that the accused policemen should be punished immediately. Addressing a press conference here today afternoon, Sukhwinder Kaur, wife of the youth Charanjit Singh, who had died under mysterious circumstances at Jodhan police post three days ago, also accused the police of non-cooperation in the case. She alleged that the police was not even providing them with a copy of the FIR registered against the youth, Charanjit Singh, and his accomplice Chamkaur Singh, in which they had been accused of stealing a number of cars from several parts of the region. ‘‘A number of family members have been making rounds of the Jodhan police post and office of some senior officials to get a copy of the FIR but no one is co-operating’’, she claimed. The woman had brought her three minor children, one boy and two girls, to the press conference. She sought a suitable compensation from the government as her husband had died in the custody of a law enforcing agency of the government. ‘‘I want the guilty cops to be punished. There should be no doubt about it. But it is also important for us that the government arranges for some compensation or employment for us so that we can make both ends meet ’’, she said. Pointing towards the children, she said their ‘innocent’ father used to work with an orchestra party and was the only bread winner of the family. She said her parent s were old and she had no means of providing for her family after her husband’s death. The SSP, Jagraon, Mr Balkar Singh Sidhu, while commenting on the allegations of non-cooperation on the part of the police said the family was welcome to take a copy of the FIR from him. He said this was a minor matter and the family had several channels like applying for the FIR copy through court. He said the police had been totally transparent in the case and was in fact going out of its way to cooperate with the family. The Horticulture Wing of the Municipal Corporation is in the eye of a storm over alleged irregularities and corrupt practices in the construction of Mini Rose Garden in Kidwai Nagar in the city at a cost of around Rs 1 crore. Senior officials of the Horticulture Wing, responsible for the development and maintenance of parks, have also been charged with bungling in the recruitment of daily-wage workers, purchase of plants at inflated rates, installation of playway equipment in parks and working of park maintenance committees. It may be recalled that the Vigilance Bureau of Police had conducted a series of raids at the office of Executive Engineer (Horticulture) at Guru Nanak Stadium about two months back and had claimed to have seized quite a few incriminating documents. However, no follow up action had apparently been taken so far. The district unit of the Youth Congress here had also levelled serious allegations against the functioning of the Horticulture Wing in general and siphoning away massive public funds in the construction of Mini Rose Garden, without evoking any response from the MC administration so far. Some of the YC activists, while charging the Deputy Speaker of Punjab Vidhan Sabha, Mr Sat Pal Gosain, and the area councillor, Mr Parveen Bansal, with being a party to misdeeds of MC officials, had threatened to resort to a hunger strike to press the demand for a high-level inquiry in the construction of Mini Rose Garden. The fast however, failed to materialise and both Mr Gosain and Mr Bansal brushed away the allegations by saying that these were politically motivated. According to a memorandum submitted by the DYC to the MC administration, the original estimated cost of Mini Rose Garden was Rs 84.42 lakh, which was later jacked up to almost Rs 95 lakh, without any major apparent changes in the project. Among the corrupt practices involved in the construction and development of the controversial park, the YC maintained, were bogus payments to labour, levelling of land, inflated cost of iron and steel in construction as well as gates and grilles and massive purchase of plants for Mini Rose Garden and other city parks at high rates from certain favourite firms. The officials of horticulture wing have also been held responsible for slack enforcement and supervisory control in installation of playway equipment in most of the city parks, which had led to a tragic accident in which a girl had lost her life. The YC has criticised the MC top brass for paying mere lip service to the affected family while the guilty officials went scot free. The civic body had even failed to carry out its promise of blacklisting the firm which had installed the faulty swings in the park, it was alleged. The working of park maintenance committees, the memorandum pointed out, had assumed scandalous proportions. Massive funds were being misappropriated through these committees as the government directive to pay 50 percent of the total maintenance cost to the committees concerned was being flouted with impunity and total funds were being drawn from MC coffers. Not only this, excess payments were being made to certain societies in connivance with some of the area councillors and even some fictitious societies were also drawing funds from this account. The DYC has urged the MC administration to order an immediate inquiry into the working of Horticulture Wing and also to make public the detailed expenditure, incurred in the construction of Mini Rose Garden, with deterrent punishment to officials found guilty on this account. Local residents feel that since agriculture is back bone of our economy, so completion of Satluj-Yamuna-Link (SYL) canal was mandatory for the Union as well as state government. They said that a large number of peasants would be benefited by this project and also morality demanded that the governments concerned should have taken up this project. But they also wanted that the there should be an equal sharing of natural resources among all states and union territories of the country and the Haryana should take initiative to share waters of Ghaggar and Yamuna with Punjab. An academician, Mr Deepak Bhalla, was of the view that though the order of the apex court should be executed, but interests of Punjab should not be sacrificed on the alter of politics. He said that if necessity was there to complete SYL project then the Central Government should force Haryana to share the Yamuna waters with million of farmers of Punjab. A professional, Mr Gurpreet Bassi, said that thousands of agriculturist who could not afford tubewells and had to depend on monsoon for irrigation, they would be benefited after completion of SYL project. He said that, however, the policy of Haryana of not giving water of Yamuna and Ghaggar to Punjab was not appropriate. He was of the view that we all lived in one country and natural resources should be shared equally and the both state governments should settle the matter out of court through dialogue. A progressive farmer, Mr Kanwaljit Singh Sidhu, said that according to a report of World Agriculture Organisation, the water level in Punjab was going down as the farmers had started pumping water from earth by tubewells for irrigation. He further said that the report mentioned that if this process continued for next two decades, the state would become a desert. He was of the view that largest food grain producer state was facing a shortage of water these days, so there was no point of sharing water with other states. He said that SYL project could only be successful and beneficial for both the states if Haryana would also share Yamuna and Ghaggar river waters with Punjab. He opined that there was no harm in sharing water but equal sharing of all kind of resources was necessary and one should not be loser in any case. A government employee, Rajan Kumar says, ‘‘If Bihar could share its coal with all other states why cannot Punjab share water resources with other non-riparian states who need water.’’ He was of the view that that the natural resources should be shared with equally by all states as we lived in one country and states were created only for the speedy development and facility of the citizens. He opined that this principle of equal sharing should also be followed by Haryana also as some region of Punjab needed waters of Yamuna and Ghaggar rivers. A senior citizen and a farmer, Mr B.S. Bhullar, said that Punjab and Haryana should share all resources like two sister states and both should keep in mind that they were member of a big family called India. He said that before the Supreme Court’s decision, the matter should have been resolved by Union Government by intervening. He opined that though the apex court had ordered for completion of the project in one year, but the dispute could not be settled, till Haryana would agree to share its water with Punjab. Resentment prevails among rice millers against the Punjab Government for non-payment for the levy rice supplied to the central pool. The Punjab Government owes Rs 200 crore to rice millers in Punjab, which it has allegedly received from the Central Government. Stating this, Mr Tarsem Saini, president, of the Punjab Rice Millers Association, told this reporter today that the rice millers had not received any payment from the state government for the past two months for the supply of rice to the Centre under the levy rice scheme. Mr Saini charged that the Food Corporation of India had made the payment of levy rice to the state government and the latter had allegedly used this money somewhere else. The FCI makes the payment of levy rice to the state government within 72 hours of the supply of rice. All payments from the FCI are routed through the state government. Mr Saini said the association was thinking of filing a writ petition in the Punjab and Haryana High Court against the delay in payments. According to Mr Saini, milling of paddy had been going on slowly because of space constraints. Only 15 per cent paddy had been milled so far and 85 per cent was still lying in godowns. He also complained of slow movement of rice by the Railways which was just between 2 and 3 lakh tonnes per month whereas it should be between 6 and 7 lakh tonnes every month. Punjab has about 70 lakh tonnes of rice lying in the godowns. Huge stocks of unmilled paddy were lying with the rice millers and in the open as 1.12 crore tonnes of paddy had been procured this year. 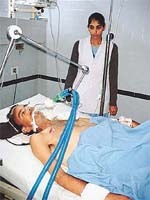 Narinder Nath at a hospital in Ludhiana. For the family of Narinder Nath, life cannot present a harsher picture. A victim of renal failure, the lone breadwinner of the family is struggling for life at Deepak Hospital here. Narinder Nath has two daughters and one son. His son Jatinder, a first-year college student, has left the college due to shortage of funds. His sisters are studying in Class X and Class VI. “I am unable to continue with my studies as all the money is being spent on father’s treatment. He is on dialysis, which is required thrice a week, and each session costs around Rs 1200. The medicine and test charges are extra”, says Jatinder. Narinder Nath quit his job about eight years ago. For the past eight years, he has been organising committees, in which he has borne heavy losses. Four months back, he complained of breathlessness, vomiting, fever and swelling on the body. “We took him to Jaipur and my maternal uncles were helpful in providing him treatment. On January 12, his condition started deteriorating and we got him admitted here in this hospital”, says Jatinder. “We cannot lead a life on mercy. He is the only earning hand in the family as my mother is a housewife. I am also looking for a job. Though my job alone is of little help, we have to survive. Till now, my relatives have been helpful, but they cannot continue with the monetary help for long. I do not want my sisters to leave their studies. God has been very unkind to us”, says Jatinder. Dr Rajan Issac says the condition of the patient is serious. The immediate need is to make Narinder Nath stabilise. “Initially the patient requires Rs 60,000 to Rs 70,000 for the treatment. Once he is stable, the kidney will be transplanted later”, says the doctor. Despite orders of the district administration and the imposition of Section 144, the Democratic Teachers’ Front organised a rally in front of the Mini-Secretariat here this afternoon. Tension prevailed and heavy police posse was ready. The rally was held under heavy police security and the teachers were told to stay outside the Mini-Secretariat. The banners on the front were removed by the police personnel and the teachers were told to stop the use of the public address system. Despite the tense situation, the members managed to go on with the rally for over two hours. Teachers from Ludhiana, Moga, Ferozepore and other districts gathered outside the Mini-Secretariat and raised slogans against Sidhu, District Education Officer (Secondary), and demanded her transfer. The teachers accused her of being rude and non-cooperative. Mr Kuldip Singh, a member of the state committee of the front, said the leaders of the front told the police that they would continue with the rally even if arrested. The leaders offering themselves for arrest were Mr Yashpal, Mr Tarsem Lal and Mr Joginder Azad. The rally ended after a memorandum of demands was submitted to the administration. The teachers, in a memorandum submitted to the SDM, also blamed Ms Sidhu for registering a false case against Mr Bhajan Singh and Mr Joginder Azad, president and general secretary, respectively, of the district unit. Last month, when the leaders had gheraoed the DEO in her office for two hours, she had registered a case of harassment, defamation and threat against a few teachers. She had complained of publishing and distributing defamatory note among teachers and principals of government and aided schools. The note was an open letter to Mr Tota Singh, Education Minister, demanding transfer of Ms Usha Sidhu and her stenographer, Mr Inderjeet Singh. In the note, members of the front had alleged that the DEO had been pleasing her sycophants, transferring and suspending teachers opposing her directions and ignoring some of their demands. Following this, the teacher unions supporting the DEO had met Mr S.K. Sandhu, Deputy Commissioner, and Mr Kuldip Singh, SDM (East), demanding a check on the activities of the front. Ms Sidhu had also written to the Education Minister and the Deputy Commissioner that she was being repeatedly threatened by some members of the front. She had also stated that the situation had caused mental harassment to her and had spoiled the conducive atmosphere of her office. Today, members of the front also demanded restoration of transfer orders passed against the stenographer of the DEO. They demanded that the cases in which the teachers had been implicated be withdrawn, besides paying timely salary to teachers from upgraded schools and exempting teachers from non-teaching duties like elections and surveys. The newly nominated District Congress Committee (Urban) President, Mr Krishan Kumar Bawa, today claimed that the party was on a strong footing on all the three Assembly seats in the city as well as two semi-urban seats of Ludhiana Rural and Dakha and predicted a thumping victory for Congress candidates. Addressing a press conference here, Mr Bawa said party activists had been asked to mobilise masses in their respective assembly segments and prepare the ground for party meetings, which would be held in consultation with the party nominees concerned and state leadership. The district unit, he added, would maintain close coordination with the candidates and run the election campaign accordingly to boost the prospects of the party. He said the Congress would seek the support of the electorate on the issues of non-performance by the SAD-BJP government, with specific reference to growing poverty and unemployment, increase in prices, rampant corruption and deteriorating law and order situation in the state. Meanwhile, Congress nominee from Ludhiana Rural seat Malkiat Singh Beermi has launched election campaign with a number of meetings with his supporters at several places. A press note stated that the nomination of Mr Beermi had been widely welcomed in the area by the people and sweets had been distributed by his supporters. However, taking note of dissenting voices gained by senior party leader Gurcharan Singh Ghalib, MP and Mr Nahar Singh Gill, Member of PPCC Disciplinary Committee, Mr Beermi has made an appeal to his party colleagues to rise above petty differences in the larger interests of the party. Mr Harnam Das Johar and Mr Avtar Singh Makkar, Congress and SAD-B candidates, respectively from Ludhiana (West) also continued their spree of meetings in the constituency. Mr Johar went round some of the colonies to make personal contact with the voters. The President of SAD(A) Youth Wing and Panthic Morcha candidate from Raikot Assembly segment in this segment Mr Balwinder Singh Bains claimed to have completed first phase of electioneering with his tour of Sudhar Bazar, Akalgarh, Chakkar, Lakha, Toosa and Sudhar village. He said there was tremendous response from the electorate, who wanted to rid the state from SAD-BJP misrule. Later, a meeting of district level functionaries of youth wing and Panthic morcha was convened at the residence of Mr Bains to chalk out electoral strategy. The state president of the Nationalist Congress Party Mr Swarn Singh today announced that Mr Subhash Chander Tandon, Mr Rashpal Singh Gill and Mr Darshan Singh Kutbewal will be NCP nominees from Ludhiana North, Ludhiana Rural and Dakha assembly seats respectively. In a meeting held at the residence of Mr Sachin Tandon, secretary, Youth Wing of the party, the NCP leadership welcomed some of the Congress activists, who had joined NCP. These included Mr Thakkar Singh (Muktsar), Mr Naresh Jaggi (Khanna), Mr Baljit Singh (Abohar), Mr Sadjit Singh, Mr Gurdev Singh, ex-MLA (Moga) and Mr Arjan Singh Mattu (Amritsar). A senior Akali leader and Panthic Morcha candidate from the Kila Raipur Assembly segment, Mr Mahesh Inder Singh Grewal, today said the elections would be a referendum on the pro and anti-Panthic forces in the state. Addressing a series of public meeting in various villages of the constituency, Mr Grewal claimed that “anti-Panthic forces disguising themselves as otherwise would be exposed. The senior Akali leader pointed out that the decision of the Supreme Court, directing the completion of the Satluj Yamuna Link Canal, was a reflection on the performance of the Badal government. He claimed that Mr Badal had surrendered the interests of the state by his inaction. He warned that the decision might have far-reaching consequences on the state economy as it might adversely hit agriculture in the state. Mr Grewal addressed election rallies in Badundi, Mohi, Jangpur, Rurka, Jodhan and other villages falling in the Kila Raipur Assembly segment. Referring to development works, he pointed out that the local MLA, a senior minister in the government, had failed to provide any relief to the people of the area. He promised that he would usher in a new era of development in the constituency. He cautioned people against returning Mr Badal or the Congress to power as both had sabotaged the interests of the state. Returning any of the two to power would spell disaster in the state, he warned. He expressed confidence that the Panthic Morcha would provide a stable alternative to both parties. A meeting of representatives of all political parties contesting elections in the Samrala constituency was held here today. It was presided over by the local SDM, Capt S S Brar, at the Nagar Council office. Mr Brar explained the model code of conduct to the representatives and directed them not to use the loudspeaker without the prior permission of the administration. Banners and pamphlets should not be pasted on walls or any other area of any individual property, he added. He also directed them to get prior permission from the district administration if any rally or conference was to be held so that security arrangements could be arranged well in time. The SDM also appealed the representatives to co-operate with the administration so that fair elections could be held. The nominations of the papers will start from today till January 23. January 20 and 21 were gazetted holidays, Mr Brar added. Sore at the discriminatory attitude of the Congress high command towards INTUC activists over distribution of party tickets for the coming Assembly elections, the Punjab Subordinate Services Federation (INTUC) has threatened to field Independent candidates from at least 8 Assembly segments in Punjab if the party high command fails to make changes in the list of party nominees by January 21. Mr Subhash Sharma, president, and Mr Piara Singh Dhillon, general secretary, respectively, of the federation, said in a joint press note here today that denial of party nomination to trade union activists owing allegiance to the Congress had caused widespread resentment among the ranks. They alleged that Mr Jagjit Singh, Leader of the Opposition in the Punjab Assembly, had played a major role in discrimination against the trade union activists in the allotment of party tickets. A meeting of the working committee of the district unit had been convened here for January 18. Mr Sharma indicated that INTUC candidates would be fielded from Ludhiana West, Dakha and Kartarpur (Jalandhar) Assembly seats, among others. 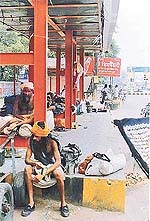 The bus stop on the Ferozepore road in Ludhiana which has been turned into a ‘permanent’ home by beggars. The begging scene in the city is becoming murkier with the passing of each day as the general affluence of the city coupled with the resultant charity continues to attract beggars from all over the country. Being the richest town of the richest state in the country, Ludhiana is an automatic destination of the destitute and the helpless from relatively poorer states such as Rajasthan, MP, Bihar, Orissa and UP. Among the hordes of migrants who get down from the various trains at the local railway station are a large number of beggars who, after begging for a while on the city streets, invite other relatives to join them. For them the city is an unparalleled haven as far as charity is concerned. The city residents, by now, are quite familiar with Rajasthani women beggars who beg in upbeat markets of the town such as the Ghumar Mandi and the Bhadaur House. They carry infants in their arms and ask people to buy some milk for these infants. The kind-hearted buy them milk but the same is re-sold by these beggars within minutes. If their requests are turned down bluntly, then these begging women resort to aggressive and abusive language also. Even if no money is given to these beggars, there are a number of temples in the city where free food is served round the clock by well-to-do businessmen and wealthy, kind ladies. They go to the various temples of their faith and choice with buckets full of prepared food and distribute the same among the alm-seekers outside these temples. Though many among them like to feed the poor, others offer free food for a specific period of time as directed by an astrologer or a tantrik as a solution to a particular problem being faced by them. The portion of the Jagraon bridge on the Bharat Nagar side is occupied by beggars on both the sides, some of whom have turned the footpath into a permanent home. The menace of beggars outside the Durga Mata Temple on the Club Road has increased so much that some beggars have turned a local bus stop shelter on the Ferozepore Road into a ‘beggars’ home’. There are reports that some cops of the nearby division number five police station are patronising these beggars in return for a ‘hafta’. Some of these so called ‘babas’ are engaged in the business of selling dope to the beggars and rickshaw-pullers who frequent the place. Another temple of the town, Dandi Swami, in Civil Lines, is a great favourite with the beggars as free food and alms are available round the clock outside the temple. These beggars are reported to be very choosy about what they are offered and they decline to accept what they do not prefer. Who says beggars have no choice? Besides the Lakkar Bridge, which has been a favourite haunt of beggars ever since ages, the Mata Rani Temple near Ghanta Ghar is another place which is infested by charity seekers round the clock. Apart from these places of worship where free food is available for the asking, a large number of ‘langars’ are organised all over the city throughout the year. Be it Gurpurb, ‘sangrand’ or some other auspicious day, there is no dearth of these langars in the city. Not only beggars, but other poorer people also throng these langars which are often held at various religious places by the respective managing committees. Business houses and individuals who can afford to do so also hold langars on various occasions by the roadside. These roadside langars are also thronged by the poor as well as by beggars. Some of these beggars also nick purses and other expensive-looking items from cars and other vehicles on the pretext of begging. A couple of women beggars start pestering the driver for alms while the third one escapes with whatever she gets hold of. The existence of organised begging syndicates in the city has made the begging scene all the more murkier. These syndicates force many an Oliver Twist to beg on city streets all day and pass on their daily collections to their dons. The children who are forced into begging are either orphaned and abandoned children of poor parents or have been kidnapped from distant parts of the country and brought to the city. Ludhianvis have taken to growing flowers in a very big way— mind you, not common flowers like dahlias, dogflowers, cannas and even if they have to be roses, the Ludhianvis don’t go for delicately scented Indian roses that pale after a day. Most of the nurseries are stocked with imported seeds of different flowers. On the shopping list of the many Ludhianvis travelling abroad is the list of seeds of exotic flowers. Ranjeet, a gardener, says: “Earlier perfumes and the latest clothes were the first priorities on our shopping list. But now I look for new varieties of flowers and seeds in departmental stores. The elegant roses, gerberas in my garden send me into an ecstasy”. Many others share the passion for growing a large variety of flowers, ferns and even exotic herbs like ‘leeks’, parsley, china and lemon grassland celery in their gardens. Dr Vivek Saggar and his doctor wife, Kavita, have a passion for a grassy lawn. But unfortunately they have no place to develop a garden. But that has not deterred them. They have a garden on their small terrace. Both said: “After a hard day’s work, it is sheer bliss to sit in our cosy garden and we get a lot of tranquillity looking at our potted flowers. The cost of maintenance of a terrace garden is rather high, but we feel it is worth. We spend quite a tidy sum on flowers, but it is well spent. Moreover, the children have also become interested in gardening. The entire family shares the joy when a bud unfurls into a flower”. One would not expect a student to grow potted plants in the hostel, but Raju living in a hostel says: “Since I have a big garden in my house in Chandigarh, I am used to flowers all around me. But in the hostel, I can’t tend to many plants so I have grown a few roses in the pots and placed on the window sill. Well a single rose can be a garden too”. Rajni, a florist says: “Flowers speak the language of love. Flowers show love more eloquently than words. Hence young people are buying flowers on many occasions. We are looking forward to Valentines Day when we hope to sell many times over than our normal sale”. Ms Bina Koachar, a resident, says: “I love my garden with a passion. I sometimes go overboard purchasing the rare varieties of flowers, but the long stemmed roses and other exotic flowers like ‘birds-of-paradise’ and tiger lilies give a lot of joy. Gardening provides me a lot of exercise and it is a good topic of discussion at the parties instead of gossiping”. Bringing into action its plans of making the city pollution free, the district police has started a crackdown on persons indulging in creating noise pollution in the area. As many as 6 cases under Sections 4 and 5 of the Noise Control Act of 1956 were registered by the city police during the past 24 hours. In all cases the accused persons were playing music on high volume and were disturbing the other residents by doing so. The police action came in the wake of a series of meeting held with the marriage palace owners and other agencies associated with organising parties in the city. The meetings were chaired jointly by the officials district administration and the district police. SSP H S Sidhu had reportedly said that the meetings were aimed at making the city free of noise pollution by first making the people understand the problem and then take a legal recourse. He had said that the administration would give them enough time to ‘behave’ or face charges. The police warning was widely reported in the media to give the public this message. According to the police briefing here today, the Sadar police has booked Satnam Singh, a resident of Nagar village, the Shimla Puri police has booked Gurpreet Singh of Tehdi road, and Satwinder Singh, a resident of Shimla Puri, on the charges of playing loud music. Three other cases were booked at the Salem Tabri police station. The persons booked were Rajinder Singh, a resident of Friends Colony, Hardev Singh, a resident of New Shiv Puri and Onkar Nath, , a resident of Peeru Banda mohalla. Police sources said the residents were urged to complain about any person causing noise pollution in the area so that immediate police action could be taken. Women organisations have raised objections against the way Indian women are being portrayed by the media. They are up in arms against the ‘male chauvinists’. Gone are the days when women took things lying down. Now women dislike their images being portrayed in television serials and films. In the cinema of yesteryears, women were depicted as hapless women. The Maharashtra State Commission for Women, based in Mumbai, has decided to target those film producers and serial directors who present women in a poor light. It has decided that women cannot be left at the mercy of male-dominated society. It formed a committee to pick out movies and serials which depict women as playthings or molls. The commission has also invited nominations from the public. Local women have welcomed the steps of the commission. They are demanding that the Punjab State Commission for Women should wake up to oppose such portrayal. The Model Town police has registered a case under Sections 278 and 304-A of the IPC against an unknown driver of an unknown Maruti car which hit a scooter yesterday and fled the scene. As a result of the accident, the pillion rider, Mr Manjit Singh, died on the spot. The case has been registered on the basis of a statement by Ms Tejinder Pal Kaur, daughter of the deceased. The Jodhewal police yesterday registered a case against Rajinder Singh, son of Mr Bulla Ram, and Ram Vilas, both residents of Basti Jodhewal, under Section 7 of the Essential Commodities Act for selling kerosene in the black market. The Jodhewal police registered a case under Sections 341,506,323,148 and 149 of the IPC on the statement of Mr Agandeep Bedi , son of Mr Mohan Lal, a resident of Tibba road, against Naresh Kumar, Sushil Kumar, Bablu, Monu, Pawan Kumar, and wife of Sunil Kumar. Mr Bedi had alleged that the six accused beaten him up and injured him. He was also threatened by the accused. No arrest has been made so far. The division number two police yesterday registered a case under Sections 341 and 506 of the IPC on the statement of Ms Shanti, wife of Mr Parkash Chand, a resident of Indira Colony, against Pappi and Suraj, who allegedly beat the complainant’s son and threatened him of dire consequences. Another case of beating was registered yesterday at the same police station under Sections 323,341,427, 506 and 34 of the IPC on the complaint of Mr Surjeet Singh, son of Mr Gurcharan Singh, a resident of Model Town against Subhash Mittal, Amit Mittal and Rahul Mittal, sons of Subhash Mittal and four other unknown persons. The complainant stated in his application that the accused had beaten him up and he was seriously injured in the attack. The accused fled the spot after committing the crime, he added. No arrest has been made so far. Four persons were booked under the Arms Act during a special drive in the past 24 hours by the city police for carrying kamanidar knives on their persons. The Haibowal police arrested Sunil Kumar Sharma alias Lucky, son of Mr Som Nath Sharma, a resident of Chander Nagar and seized a kamanidar knife from his possession. The division number seven police arrested Monu, son of Mr Dharam Pal, Vijay, son of Mr Hans Ram and Sonu, son of Mr Dharam Pal, all residents of Mundian Kalan village and booked them separately under Section 25 of the Arms Act. The local police while on patrolling on the Roomi-Cheema Road arrested Surjit Singh alias Seeta on a scooter and seized 32.5 kg of poppy husk. The police has registered a case under Sections 15, 61 and 85 of the NDPS Act and has impounded the scooter. The CIA staff arrested Resham Singh of Bhaini Gujjran from Dholan bus stand and seized 6.93 lt of illicit liquor from his possession. A case under Sections 61, 1 and 14 of the Excise Act has been registered. The Humbran police arrested Ram Asra of Bhatta Dhua and Pawan Kumar, residents of BS Brar spinning mill of the same village, while playing cards with stake and recovered Rs 1,200 along with a deck of cards. Both have been booked under the Gambling Act. The Civil Lines police has registered a case of fraud under Sections 406 and 420 of the IPC on the complaint by Mr Amritpal Singh Sidhu, a resident of Model Gram, against Navin Datta, Anil Chandel, Anil Datta and Subhash Datta, all residents of Government College Road, for allegedly duping the complainant of Rs 20 lakh. Mr Sidhu stated that the accused were given Rs 18 lakh through a cheque and Rs 2 lakh in cash for sending the complainant and his family abroad. But the accused neither sent the family abroad nor returned the money. The Haibowal police has registered a case under Sections 509, 336, 324, 323, 148, 149 and 506 of the IPC against Avtar Singh, alias Taari, Sarabjit Singh, Gurmel Singh and Gurtej Singh for allegedly teasing some girls on Lohri evening and firing in the air when asked to behave themselves by the guardians. Mr Ram Rattan, a resident of Durga Puri, alleged that while he was celebrating Lohri outside his house along with other family members, the accused arrived on the scene and started teasing the girls. When they were asked to stop their rowdy behaviour, the accused attacked them and fled the spot after firing in the air. The Haibowal police has registered a case of alleged kidnapping under Section 364 of the IPC on a statement of Mr Vijay Kumar, a resident of Rishi Nagar, against Sudesh Kumar, a resident of Haibowal Khurd. The complainant stated on Monday that the accused arrived at his house two days ago and took away his son Vinod Kumar on a scooter. His son had not returned home till now and he suspected that the accused had kidnapped his son. The Salem Tabri police has registered a case under sections 341, 323, 148 and 149 of the IPC against Amarjit, Ashwini, Ashoka, Pamma and others on the complaint of Mr Rajesh Kumar, a resident of Panjabi Bagh mohalla who alleged that the accused forcibly entered his house on Lohri night while his family members were celebrating the festival. The accused beat up the family members and fled after injuring them.